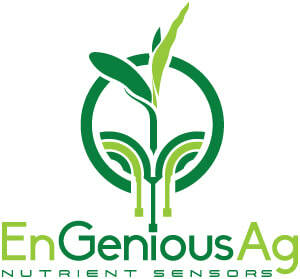 EnGeniousAg LLC designs, manufactures and deploys low-cost, instant readout, high-performance, field-based nutrient sensors for crops, soils and water, thereby improving agronomic management practices, increasing grower profitability and sustaining the environment. Pat Schnable is a distinguished professor and Iowa Corn Promotion Board Endowed Chair at Iowa State University where he also directs ISU's Plant Sciences Institute. He received his BS from Cornell University, his PhD from Iowa State University and conducted post-doctoral research at the Max Planck Institute in Köln, Germany. Previously, he co-founded Data2Bio LLC and Dryland Genetics LLC. James Schnable is an assistant professor at the University of Nebraska-Lincoln. He received his PhD from the University of California-Berkeley in Plant Biology. His current research focuses on quantitative genetics and phenotyping in corn and sorghum. Previously, he co-founded Data2Bio LLC and Dryland Genetics LLC. Xinran Wang is an electrical engineer. She has extensive experience in design, manufacturing and testing of MEMS sensors, electronic circuits, and sensor systems. She obtained her B.S. in microelectronics from Wuhan University, China, and M.S. in Physics from Chinese Academy of Sciences.